Singareni has released the first installment or Rs. 50 crore for construction of Kothagudem - Sathupally Railway line. 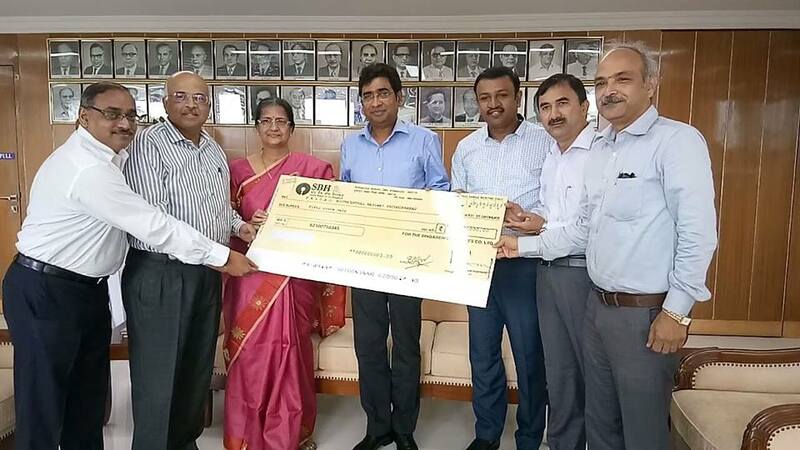 Sri N Sridhar, IAS, C&MD SCCL has handed over a cheque to Sri Vinod Kumar Yadav, General Manager, South Central Railways at Rail Nilayam, on 5th July 2017. C&MD requested the Railway authority to take necessary initiatives to complete the railway line before starting of the OC Project at Kistaram (Sathupally) in the year 2019. Its already known that Railway board has issued permissions for construction of Kothagudem-Sathupally broad gauge railway line. Singareni has agreed to bear the construction cost of 53.20 km railway line amounting to Rs. 620 crore. As part of this, Rs. 50 crore was handed over to railways. Land acquisition was already started and tenders were called for the construction of few bridges in the government lands, Railway officials explained. SCR authorities requested the Singareni authorities to cooperate for acquisition of forest lands and private lands and initiate action to get necessary permissions from the Government. C&MD responded positively and affirmed assurance. Funds will be released from time to time as required by the railway authorities for construction cost, C&MD said. The project will be completed within two years from the date of completion of Land acquisition, Railway General Manager Sri Vinod Kumar said. Sri N. Srinivas, ED (Coal Movement), Sri J. Nagaiah, General Manager (Coordination), SCCL and Sri N. Madhusudhan Rao, Chief Operation General Manager, Smt. Padmini Radhakrishnan, F.A & CAO, Sri G. Brahmananda Reddy, Chief Engineer constructions, Sri B. Nagya, Chief Traffic Manager have participated in this programme. After completion of this Railway line, huge amount of coal will be transported from Sathupally to Kothagudem in an environment friendly way. The present production and transport from JVR OC mines is 55 lakh tonnes of coal per annum. It would reach to 100 lakh tonnes shortly and need to be transported. The coal is supplied to the thermal power stations and is being used by KTPS Paloncha. Bhadradri power plant under construction at Manuguru and Yadadri Power plant under construction at Nalgonda will also use the coal produced from Sathupally OC.